It’s because of officespace—or more specifically the lack of officespace. Startups and spinoffs trying to expand and grow beyond the University campus have no place to locate to continue to do business locally. Take a look at those two middle columns. Outside of 1789 Venture Lab, home to just nine startups currently, and LAUNCH Chapel Hill, which has space for no more than 16 startups at any given time, there is simply no space in our community for startups and spinoffs to locate. So why don’t we have officespace? The short answer is that, for a long time, our community actively said it did not want commercial development, retail, or officespace uses. A draft town document from 1985 stated plainly: “We envisage Chapel Hill as a primarily residential community in which a diversity of ideas, people, opportunities, and appearance is most highly valued.” This sentiment was expressed in local policies that greatly restricted the density of development, limited commercial and retail uses, and imposed complex, costly, and time-intensive regulations on all types of development. Now, our community is experiencing the consequences of these policies. Our local governments are funded primarily from property taxes, which drive up housing costs and make our community less diverse, more white, and more wealthy. Retail stores that would have located in our community and provided our governments with vital sales tax revenue instead located just across the county line in Durham (and now Chatham). Other types of commercial and business activity that could have located here had no space to do business and had to go elsewhere. The result of these policies is a local economy that is primarily driven by the restaurants and bars of downtown Chapel Hill and Carrboro, which do not provide sufficient tax revenue for our governments to operate sustainability without placing an excessive property tax burden on residents. To get the officespace we now need to reverse these negative consequences of past policies, we have to be bold in our policy changes and lean into positive change for the future of our community. Talk of diversifying our economy by expanding our commercial and retail sectors has been ongoing in our community for years now. What’s been missing is actual policy change and action to turn this talk into reality. 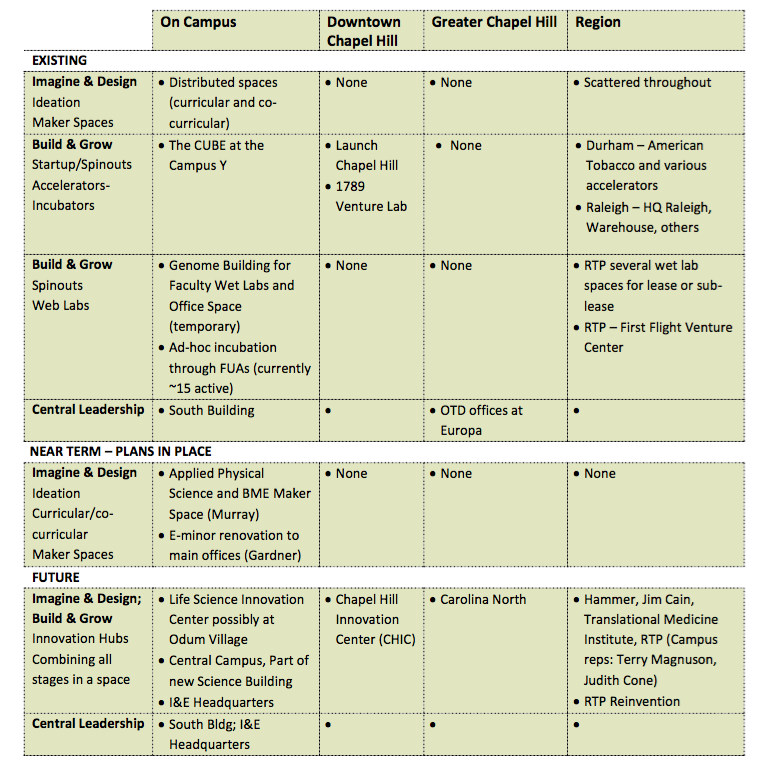 Currently, it’s not easy to build anything in Chapel Hill or Carrboro, let alone innovative and modern officespace. Our development approval processes are long, time-intensive, and expensive. By maintaining these processes, we are sending businesses who may otherwise want to stay local to Durham or Raleigh, where space already exists and is much cheaper. We also have a tendency to overstudy our problems in Chapel Hill and never get to implementing the policies and strategies required to create the change we seek to strengthen our community. We have to move away from this tendency, become comfortable with change, and empower our policymakers and town officials to take action to create change today if we hope to be prosperous tomorrow. The recent Downtown 2020 effort provides an example of how we can start creating a culture of doing rather than studying. Instead of conducting yet another analysis of downtown, the new Downtown 2020 strategy simply outlines five core areas of focus, connected with action items to be implemented over the next two fiscal years. So why don’t we do the same right now to solve our officespace problem? Here’s an idea: Let’s start by implementing zoning changes near campus, in downtown, and along transit corridors to make it possible to build modern offices, coworking spaces, wet labs, maker spaces, and life sciences officespace by right. From here, we could work on longer-term changes that will be necessary to make our community competitive for innovative companies. Our competitive advantage over neighboring Raleigh and Durham is that we are already a compact community with the second largest transit system in North Carolina, and data show that most Americans want to live in mixed-use communities that don’t require the use of a car. Because we have not sprawled, Chapel Hill and Carrboro are in a much better position than our neighbors to achieve this vision. By adding officespace to attract and retain new companies, directing additional money and resources to grow Chapel Hill Transit, and adding mixed-use development throughout our community, including a variety of housing choices to appeal to new private sector employees, we can gain market share with startups, reduce our overreliance on residential property taxes, and put our community on a sustainable path to being a leading sustainable, 21st-century community. All it takes for us to start achieving this vision is to act now rather than keep studying a problem we’ve already diagnosed. Let’s say yes to positive change today, for a stronger community tomorrow. My comments are all anecdotal, based solely on my personal experience working in the tech space in the area for a long time. And observing the changes. Starting with Durham. What spaces are attracting business? Are they in some office park on the outskirts? Are they on Duke campus? Not the ones I am aware of. They are in the American Tobacco campus or down town. A good friend of mine pulled out of Carrboro several years ago, and is now in downtown Durham. Reachable by transit, and plenty of parking near by. More importantly, there are near by places for workers to go for lunch or after work to socialize. In fact, these options are growing. While on-campus locations sound like a good idea, you have parking issues, and night-life issues, and for non students, you have housing issues. Younger tech workers love to live near where they work. They do not want to drive in from Clayton or Holly springs. Next: On to RTP. I work there, and I find the sparseness, spread out, nature of RTP terrible. As an urban dweller my entire life, I found it almost impossible to fathom (when I first arrived) there no places to go in RTP to eat or drink or hang out. or ... to live. But there is a bright spot. The Frontier in RTP. I am not sure how the money works out, but you all should make a field trip to this place. Borne out of an former IBM building, the Frontier is a free to the public incubator space with free co working, conference rooms and social events. It is - at least - on one transit line . I have been talking with some of the people there about ways to make it more multi modal. If the Frontier place was near living spaces or other entertainment options, it would be the hottest place in the area. That will not happen in my generation, but there is hope for the RTP to reverse the mistakes of their earlier design principals. Find space for it down town. Allow space to be built down town, and located on transit routes or add real transit options to make it reachable. And yes. Stop studying and start doing. I repeatedly requested flex-use space at Obey Creek and was completely ignored. CHALT has repeatedly stated that we need additional office space and they've been blasted as exclusionary. So it's great to hear that you are finally on board, Travis. Now if only the town's economic development officer would acknowledge that his previous claims that we have too much unused space, we might actually begin to plan for change. CHALT doesn't seem to have any interest in letting anything be built "by right," which is one of the key takeaways (if not the key takeaway) of Travis' piece. A form-based zoning code is regulation of land just as much as traditional use-based zoning. Both reflect the community's wishes, in different ways. It's not "liberal" to favor R-2 zoning versus WR-3 zoning. It's a false framing to assert that those who don't subscribe to the CHALT agenda are in favor of "laissez-faire" uncontrolled development; the lengthy form-based code provisions show otherwise. What some of us who do not consider ourselves CHALT members believe is that a predictable zoning regime which reflects what the community would like to see be built and gives certainty to developers is preferable than current system, where most land has unrealistic zoning applied, developers have to guess at what the nine members of Town Council will allow to be built, and projects can take an unnecessarily long time to progress. ....is the comparison between Euclidian zoning and Form Based coding. Euclidean Zoning-Focuses on the land and important things like land carrying capacities and setbacks. Focuses heavily on *use*. Form-Based Coding- Relies on design concepts, patterns and physical attributes of buildings. Focuses heavily on building form as it relates to streetscape and adjacent uses. One is more appropriate for areas where the land use and carrying capacities are already well entrenched and design is more important. The other is more appropriate for areas where issues like storm water are less well defined or supported by utilities and concerns about use are more appropriate. In he case of EF, stormwater runoff had been severely neglected for many years, it is affecting downstream residences and it was well past time to revisit . I would argue therefore that traditional Euclidean was a more appropriate than a Form-Based Zoning. This is especially true since the Chapel Hill's Form-Based coding was (and still is) in need of better definition. That's a novel distinction between the two types of zoning regimes that I've never heard of before. Form-based codes certainly are concerned with things like setbacks and there's nothing that limits the applicability of stormwater rules or other regulations. Geoff, It would have been a good thing to redevelop on impervious surface *if* the stormwater had been appropriately handled. Sadly not so. An opportunity to at least partially rectify the stormwater situation through development was missed and the cost fell back on the taxpayers through a bond. Geoff - It seems as though you have unwittingly fallen victim to misinformation about CHALT's stance on Form Based Codes. We have never rejected the idea of a Form Based Code - we worked diligently to improve the Form Based Code that was proposed for the EF area before it was passed. Do we share the basic values that we sought to have included in the code? Would you support incentives for affordable housing? I know we would. Would you support incentives for green building? I know we would. Would you support pocket parks and balanced green space? I know we would. As it stand now, the current code isn't even conducive to a basic like walkability and text amendments for block length will have to be enacted. This code was not ready for prime time. Lee Einsweiler, who was commissioned to create the code, wrote a very different one for Asheville NC. As a matter of fact, there are better FBCs throughout the whole country.At the June 20th Council meeting, Mary Jane Nirdlinger stated that Staff was "now studying award winning codes." You can be sure that the CH FBC would not be one of them.... It's what should have happened before, but better late than never. Hopefully, the Alexan development will be a visual reminder of what happens when a Town does not do its best work and will inspire us to do better. Please don't make assumptions about the CHALT stance on providing certainty to developers - that was never the issue. I do appreciate CHALT members' efforts to lobby for improved block-spacing, along with the recommendation from the Town's own Planning Commission. But let's not pretend that CHALT members (perhaps not CHALT itself, because I'm not sure it existed then) were in favor of doing anything that would expedite or streamline the development process in Ephesus-Fordham, or anything to encourage a change in the mix of buildings on the site. There was great concern expressed that the FBC would lead to redevelopment which would push out existing local businesses such as, most notably, Plaza Dry Cleaners; the dry cleaners' loss of its lease was claimed to be the direct result of the reasoning. As to the other goals, I find energy efficiency, affordable housing, and increased green space to be good things. But the CHALT approaches to these matters aren't necessarily the ones I would take. Hey, just wanted to mention Perch Studios, the coworking space in downtown Carrboro. We have all different types of memberships; including personal desks, communal table and office suites. However, we too need more affordable space. We receive inquires all time about available office suites, which we just don't have enough office suites to accomadate. ..time I have agreed with Travis Crayton. The previous leadership had the cart firmly before the horse permitting all of these apartments. Leverage the competitive advantage. Build office/lab/development commercial spaces that startups want in hubs along the existing transit infrastructure. Keep the emphasis on parks, greenways, compact life style and connectivity. Do not just enable the new ideas coming out of UNC, *recruit* them. People also want to live in places where they know what can and cannot be thrust upon them. I suggest that there be a clear dialog on what and where you can't say no. A lot of the studying Mr. Crayton refers to is the result of the lack of thought put into, and the attempts to force or sneak proposals and regulations by the people who have a lot invested here. Empowering policymakers and town officials has not stood the test of time nearly as well as that draft town document from 1985, however 40 year old plans do require a revisitation.